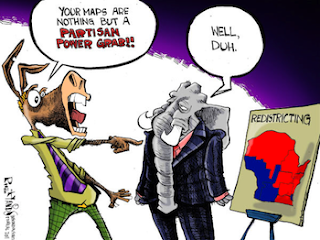 Signal Support for "Iowa Model"
Last week, dozens of candidates running for the Wisconsin Legislature in the 2018 November election informed Common Cause in Wisconsin (CC/WI) of their support for ending partisan gerrymandering in Wisconsin and, instead, establishing a non-partisan redistricting process based on the system established in Iowa, in 1980. As of Monday morning, September 17th, there are 52 State Assembly & 12 State State Senate Candidates and 2 Statewide Candidates whom we know support the "Iowa Model." To see the constantly updated listing of supporters, go to this page on the CC/WI website. While the legislative leadership continues to oppose this reform and refused to hold even a public hearing during the past legislative session, redistricting reform is already very much an issue during the current election season. 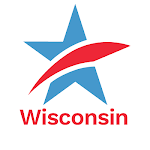 We want to make it simple and easy for Wisconsin voters to see which state legislative and statewide candidates support the non-partisan redistricting reform embodied in the "Iowa Plan" by providing a continually updated list of those candidates on our website. 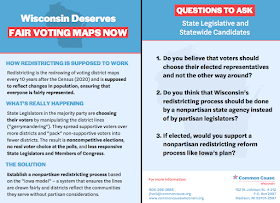 Citizens can urge candidates to support non-partisan redistricting reform and request that they get their names on this list. Candidates must be pro-active to have their names appear on this site. Dozens of State Legislative Candidates Tell CC/ WI of Their Support for Ending Partisan GerrymanderingTweet this!